I have fond memories of the Firehouse. It was the first really nice place I went to after moving to Sacramento. I’ve enjoyed family dinners, and dinner with some great people (non-relatives, not that my family isn’t great!). It was where a complete stranger bought me a bottle of 1995 Merryvale Profile as a birthday gift. On this occasion, which wasn’t a real occasion, other than to experience some fabulous food, I enjoyed the January Chef’s Tasting Menu with paired wines. Located on Second Street, between K and L, it’s easy to get to and has valet parking available for a relatively small amount. Otherwise there is metered parking along the street that is monitored until six, I believe. If you’ve never been to the Firehouse, it has a very unique decor. It is heavy and dark, with super-sized prints decorating the walls. I liken it to the salon of a wealthy Victorian nobleman… but never fear, there are no heads, furs, or shotguns next to these prints. 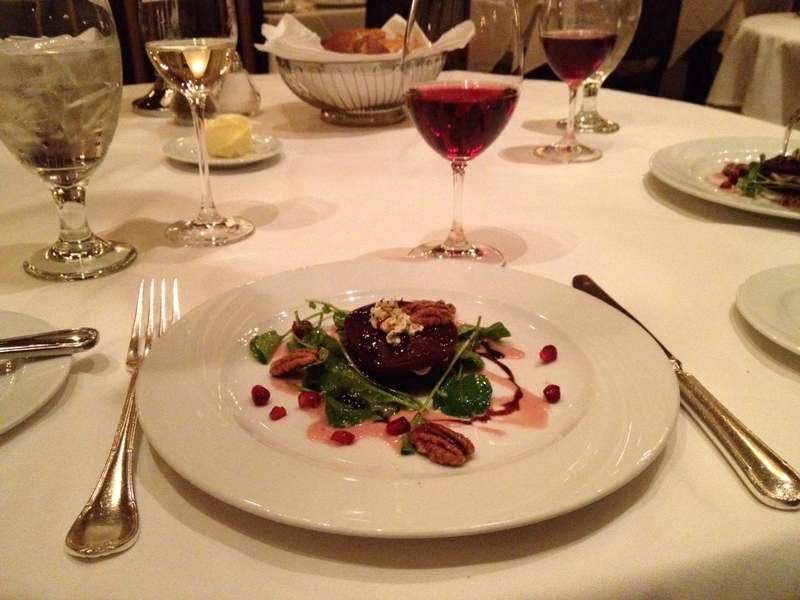 It’s velvet, mahogany, deep red and just the type of place to go for an amazing meal, service, and wine. The booths against the wall are half moon-shaped, and set comfortably apart, so you can easily enjoy your meal without having to worry about your neighbor pulling a Samwise Gamgee and eavesdropping. These are also very cushy, which is good, since you’ll want to settle in and enjoy this dining experience! 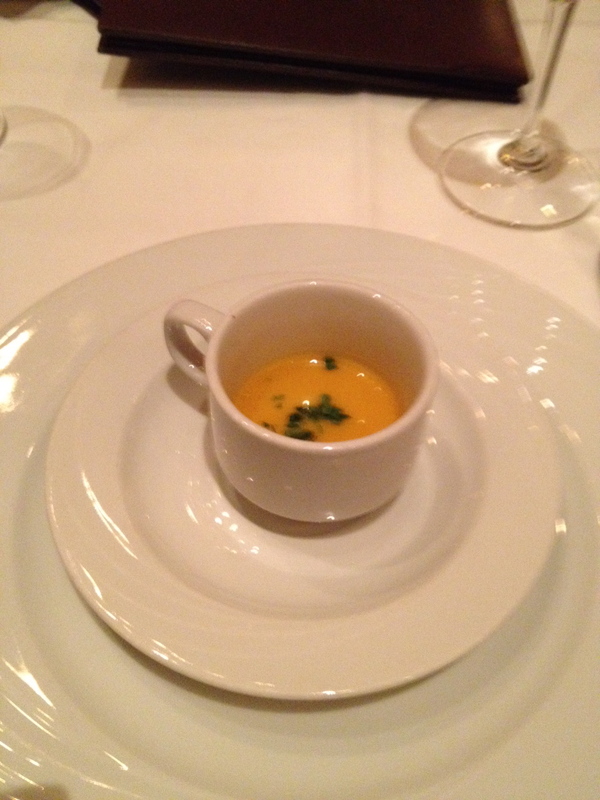 First came an amuse bouche of warm carrot and coconut soup garnished with parsley. It was sweet and perfect to prepare the mind and stomach! Next up (not on the Tasting Menu) were half dozen oysters and sparkling wine, which was a delicious Brut from Argentina. My complaint with these was that they were a bit too large. In this case, bigger is definitely NOT better. First course: Parsnip-apple bisque with calvados syrup and prosciutto-apple fritter paired with a 2007 Pio Cesare Moscato d’Asti. If you’ve never had this kind of wine, be sure to at some point. It is refreshing, light, and pairs excellently with intensely rich flavors. 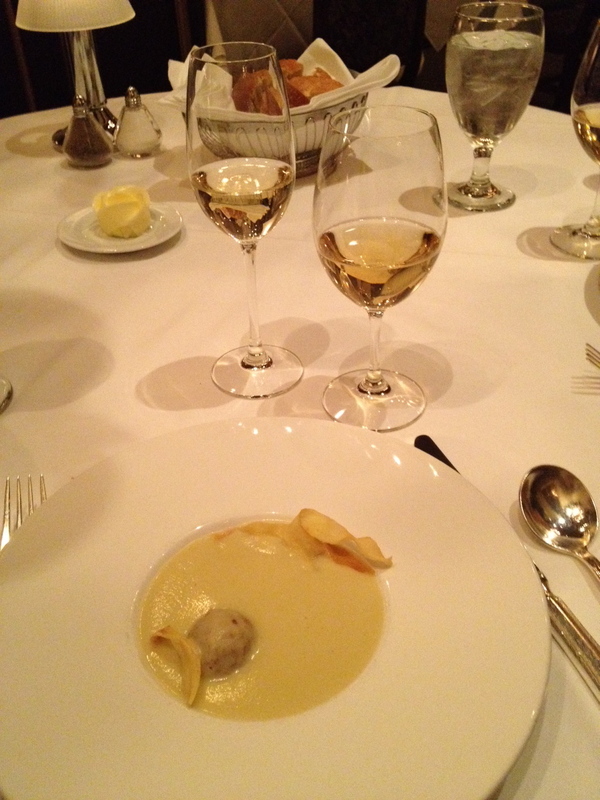 Its effervescence and acidity cut through the richness (insert: fat) of this bisque and brought umami to the fore. 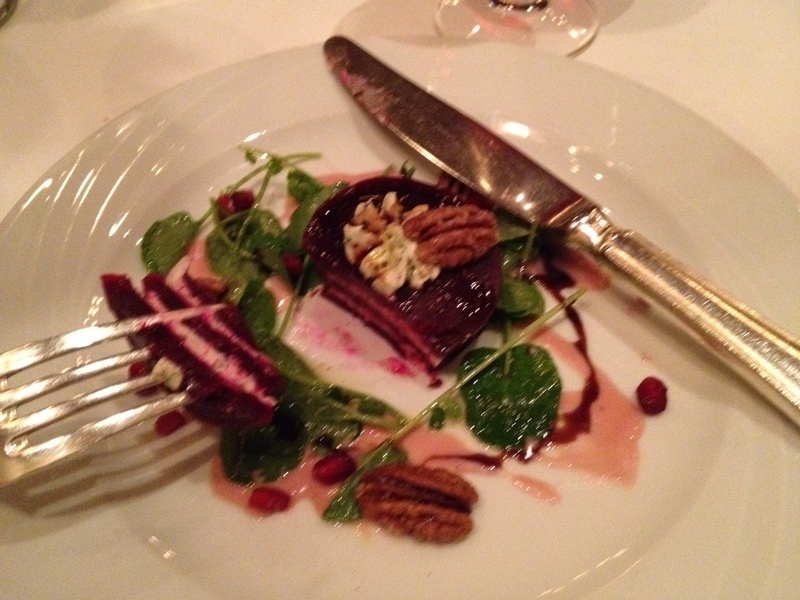 Second course: Layer “cake” beet salad with roasted beets and chevre-shallot mousseline, candied pecans, watercress and pomegranate molasses vinaigrette. Paired with a 2010 Cleto Chiarli Lambrusco di Sorbara D.O.P. I loved this salad. The flavors and textures melded and mixed together perfectly, with the sweetness of the beets counterpointed by the tart pomegranate, and the crunchy pecans balanced by the creamy chevre. The wine, a tart sparkling red, worked surprisingly well. I’d never had a sparkling red like this, and I’m not sure I’d have it again, but it was excellent here. 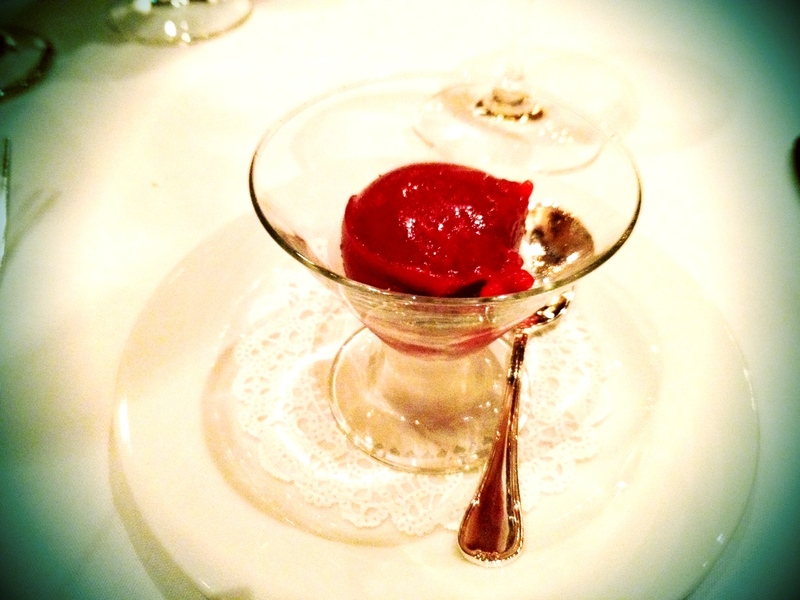 Next came a palate-cleansing intermission of pomegranate sorbet. The serving size was a bit much and made me feel like I was already at dessert. It also cooled off my mouth a bit too much. But then again, who cares, it was delicious! 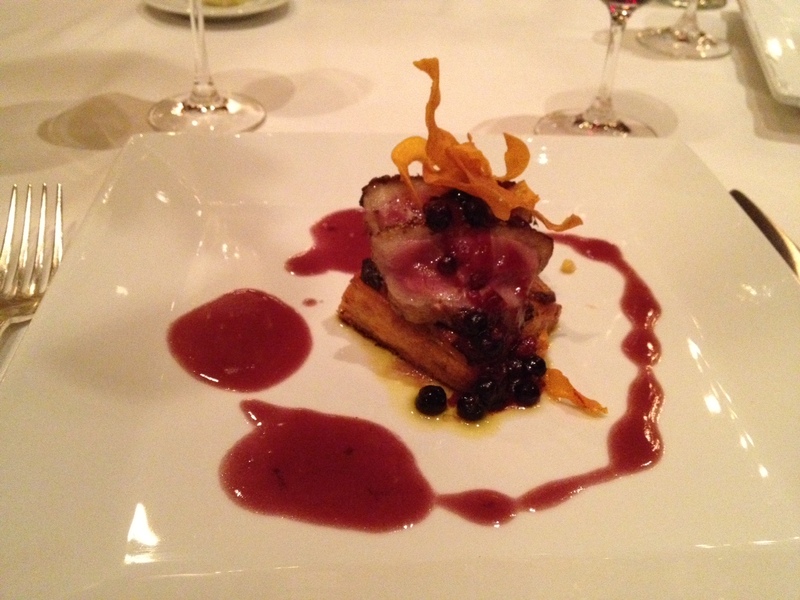 Third Course: Duck with huckleberries. Pan roasted duck breast with toasted coriander and fennel seed, yam gratinee with tarragon beurre rouge. Paired with a 2009 Bonneau Sangiacomo vineyard Pinot Noir from Carneros. Artfully presented, it was… well… ducky. But not the way I remembered duck. It wasn’t at all gamey, but was rich and fatty. It came complete with skin and fat, from which I completely stayed away, but I tried some of the meat, and the accoutrements were quite nice. This was probably my least favorite of the courses. The paired wine was a lovely deep red ruby, that started out complex, but ended up a wee bland at the end. However, it was one of those American wines that stands up well on its own. I would have liked to enjoy a glass of this by itself. 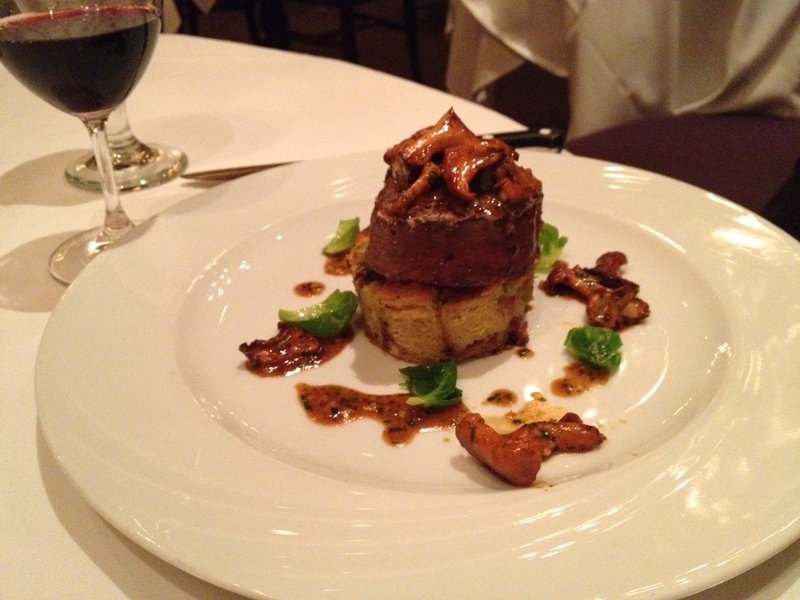 Fourth course: Chargrilled filet mignon with wild mushroom demi-glace, bacon leek bread pudding and brussel sprouts. Paired with a 2008 Edge Cabernet sauvignon from Napa Valley. My version was made with a gigantic and ridiculously delicious scallop. This was also fabulous. Since I’m such a big fan of mushrooms, I loved the demi-glacé and the brussel sprouts were also an excellent addition, giving it just a bit of crunch with the mushrooms. 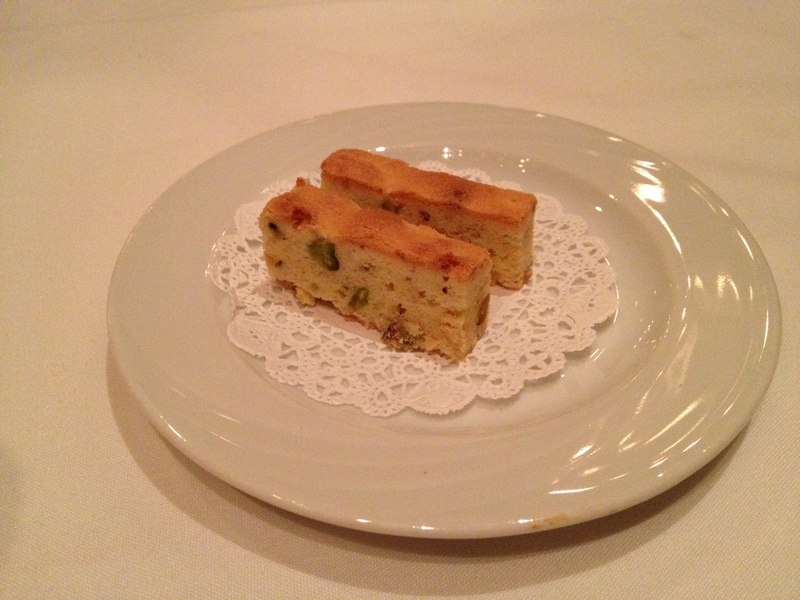 But what took the proverbial cake was the bacon-leek “bread pudding” that served as the foundation for this building of gastronomic delight. Perfect chunks of bacon (sorry, I just couldn’t help myself!) were suspended in pillowy soft, savory bread. 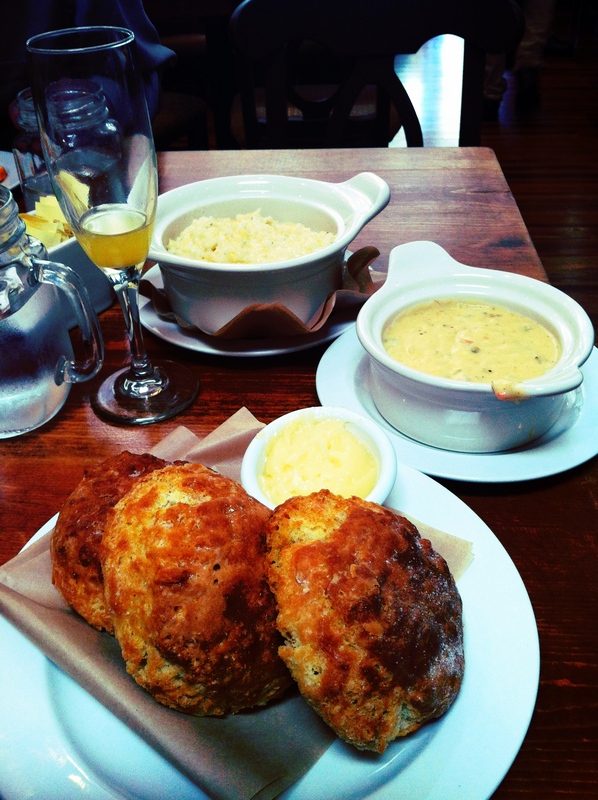 I ended up eating this for lunch the next day… and it was STILL delightful. If you go to the Firehouse and this is on the menu, I highly recommend it. The filet wasn’t quite as good, but the last time I had a bite of filet was at The Kitchen, so this may be a slightly unfair comparison! The paired wine was kind of meh; I think it was too young. Frankly, I was a bit surprised that they’d include a 2008 on this menu. I’d lay down a bottle like this for at least a couple more years. Final course: Tres leches de chocolate. Chocolate three-milks’ cake with butter pecan crust, port fruit compote and a vanilla anglaise. Paired with a 1927 sherry from Pedro Ximenez Solera from Montilla-Moriles. This was one of the thickest, most flavorful sherries I’d ever tasted. The legs on this were longer than Cindy Crawford’s! It was viscous, and had the color of motor oil (a good thing!) and had an intense, but not unpleasant, black licorice flavor. With the dessert, it was brown sugar on my face. 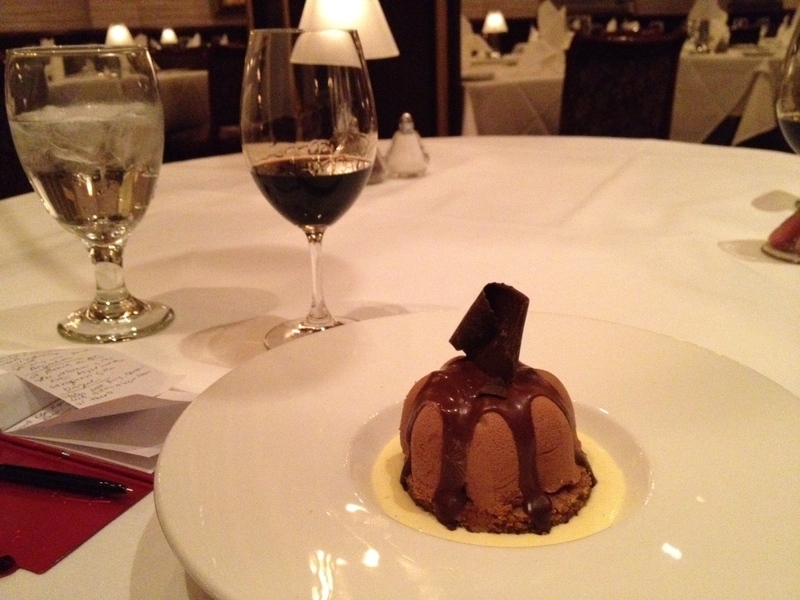 This cake was extremely rich, and for someone who isn’t the biggest chocolate fan, a bit much, even with the anglaise. However, if you are a choco-holic, this is most definitely the dessert for you! I had about half of it and called it a night. 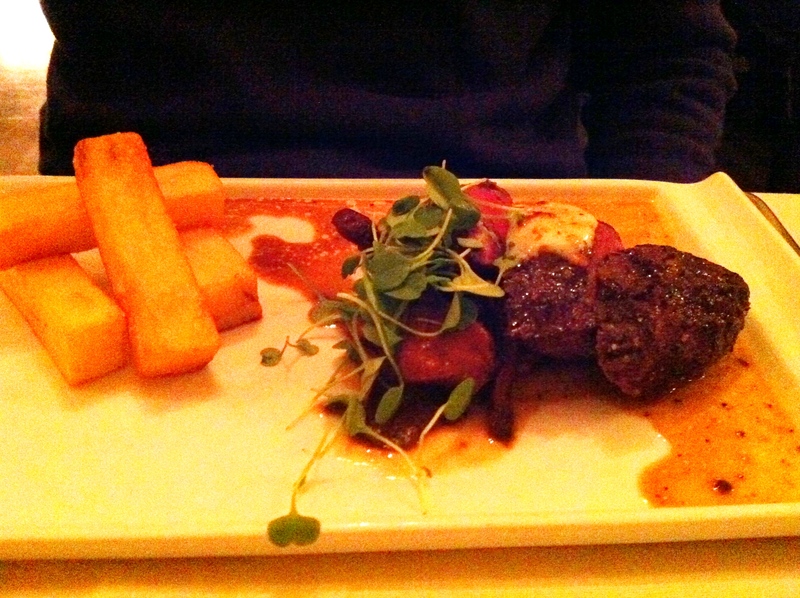 To end the meal, as if you can stuff any more into your belly (no images of Mr. Creosote, please! ), a pistachio orange blondie cookie. I very much enjoyed this little bit of crunchy neutrality as I cried “Uncle” for the evening. 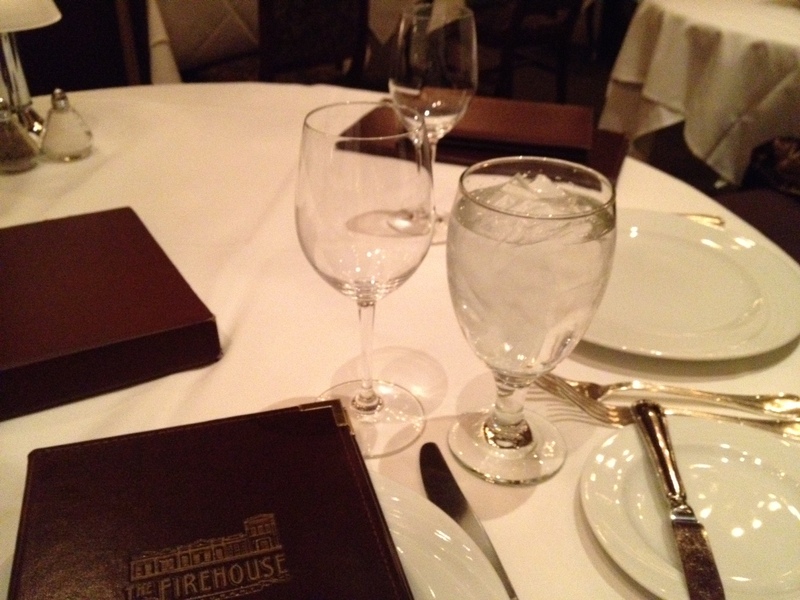 The Firehouse is a perfect locale to mark an Anniversary, get engaged, or to celebrate just about anything. They have a lovely courtyard area that also serves as a wedding/reception venue and is a great place for lunch during the warmer months. Mario Ortiz, the wine director/sommelier, who I thought was retiring, but whose name is still on the menu, would be happy to show you the downstairs wine cellar and talk about wine until the cows come home. This is a restaurant with impeccable service, presentation, attention to detail, and a desire to make your meal a memorable one. 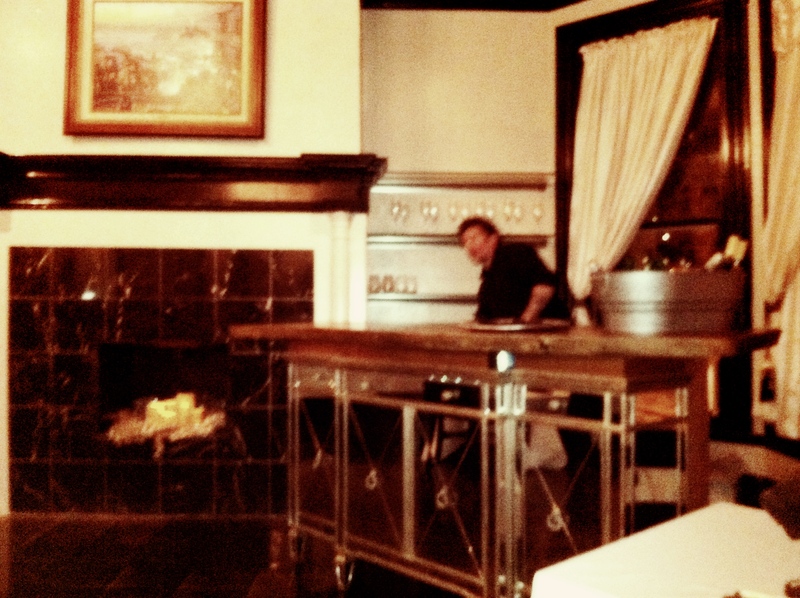 They also have various events, such as special winemaker dinners and wine tastings. While it is not exactly cheap to eat there, they do participate in Sacramento Dine Downtown Week and they just started a weekly lunch deal that looks pretty killer. If you are on Facebook or Twitter, they communicate specials and events quite frequently. Restaurant Thir13en, heretofore to be known as simply 13, occupies the area formerly used by Chanterelle in the Sterling Hotel. Being a fan of Tuli and wishing Adam nothing but success, I was very excited to check out his new venture. Going there on a mild summer evening is, in fact, one of the best ways to spend a few hours with close friends, sipping on a glass of wine or a signature cocktail, and leisurely chewing some cheesy comestibles (random Monty Python reference. If you get it, score 5 for no embarrassment, 3 for slight embarrassment… crap, I keep leading you down the garden path, Mrs. Bueller. Wow. I’ll stop.) So when I noticed that they were participating in Sacramento Dine Downtown Week, I was eager to introduce our friends Jeb and Lea, who are new to Sacramento. If you are unfamiliar with Dine Downtown, it is a week (actually ten days, I think) where participating restaurants offer a prix fixe menu of three courses for $30. Many also do wine pairing for an additional $15. 13 has a very cozy feel, with dark woods, a relatively low ceiling, and soft lighting. It is intimate, comfortable, private, yet not isolated. 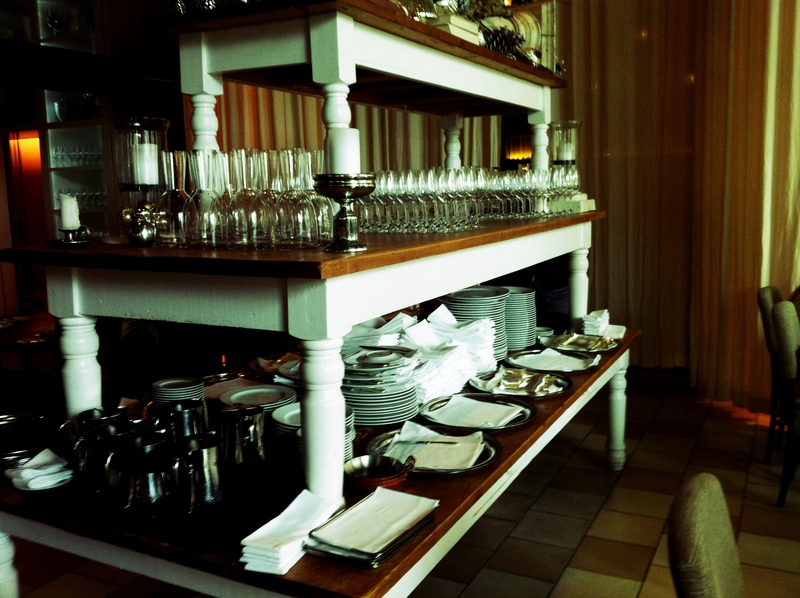 There is also an upstairs dining room that is a new acquisition for the restaurant. Situated off the main foyer of the hotel, it was a hair salon in its previous life. I’d guess they can probably seat about 40, 50 at the most. In order to reach it, you have to go back out the front door, up the stairs and into the hotel through a side stair way. This dining room is enclosed by glass and accessed by two heavy glass doors. 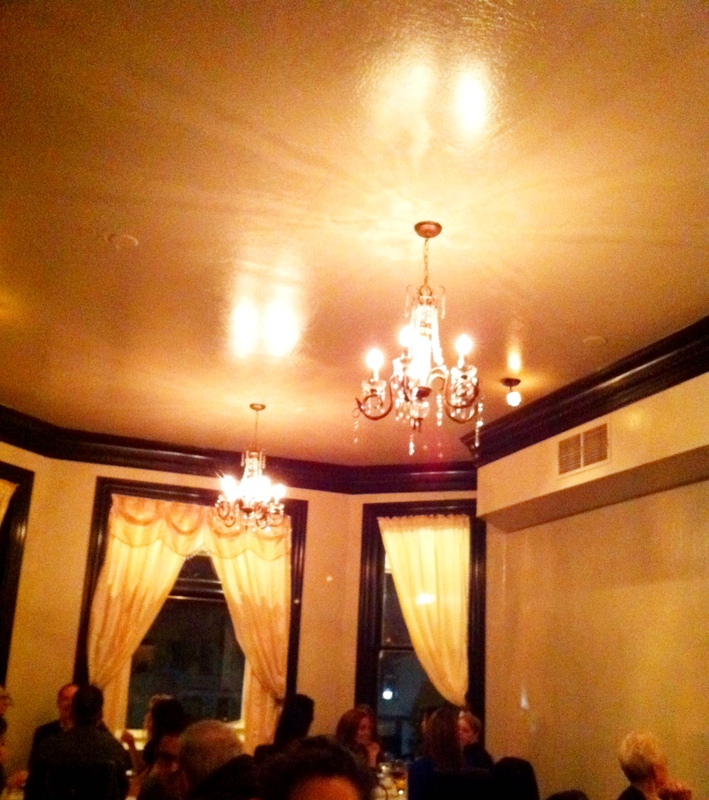 On this night there were no available seats; I’m sure Dine Downtown brought out a lot of patrons. This is where we were seated. Immediately, I noticed the noise level. It was nearly impossible for me to hear the other people at our table and it took time to adjust my ears and brain enough to carry on a conversation. Also, the restroom is back out the glass doors, up the stairs, to the left down the hallway, and on the right. There is only one. However, you can also take the elevator back downstairs to use the restrooms in that dining room. 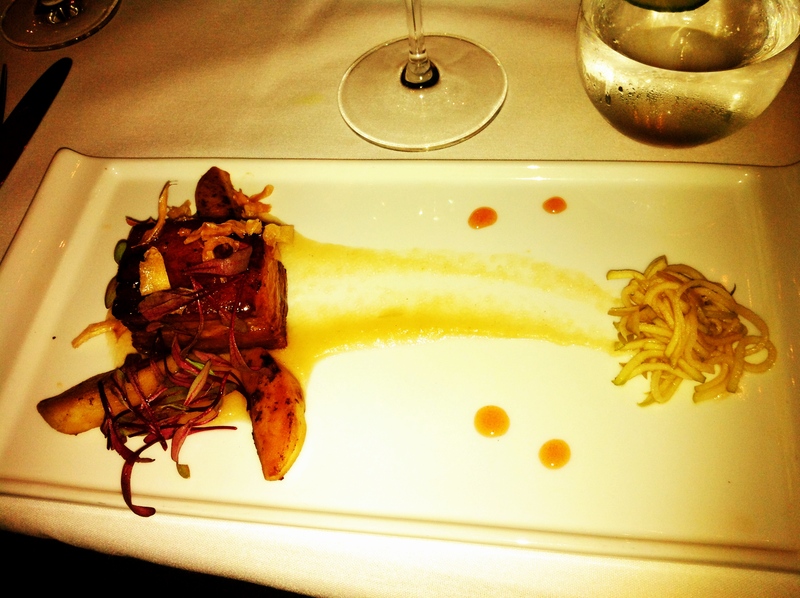 The first course: 12 Hour Beeler Ranch pork belly with apple “3” ways, parsnips, and bulls blood. This was paired with a chardonnay. Obviously I didn’t order this, so I can’t speak for its flavor or texture. Needless to say, it was a hit with the person who ordered it. My first course was a beet salad with pistachio-crusted goat cheese, arugula, blood oranges, fennel, tossed with a golden balsamic vinaigrette and paired with a sauvignon blanc. The goat cheese was fabulous. 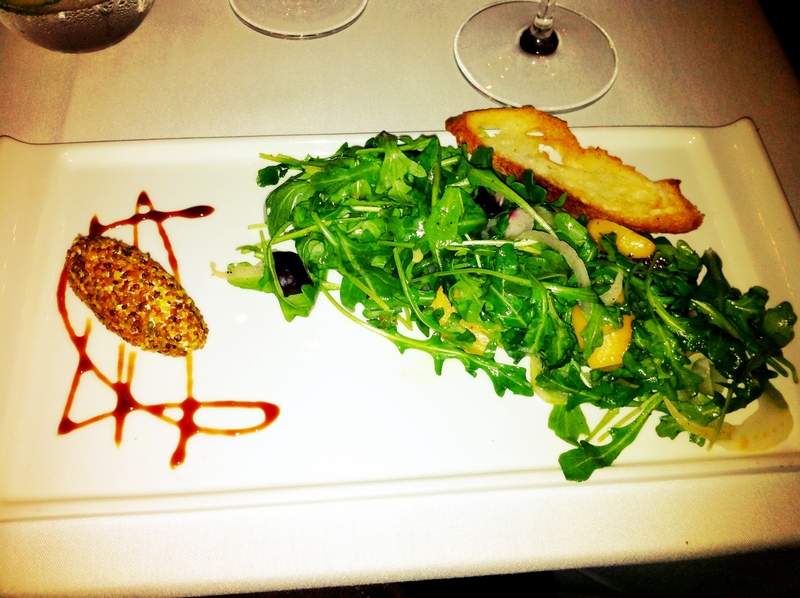 I loved the crunchy texture of the pistachios as a counterpoint to the smooth goat cheese. Calling this a “beet” salad was a bit of a misnomer, however, as it was mostly arugula. I really enjoyed this. It was perfectly dressed and the crouton was also a great addition to add a little bit more crunch to the overall dish. The second course was a sous vide and seared Passmore Ranch sturgeon perched atop a Tasso-braised rainbow chard, surrounded by a pillow of buttermilk parsnip puree and sunk in a lake of sauce almondine. If you’re wondering what the heck “sous vide” means, check this out: http://en.wikipedia.org/wiki/Sous-vide. It was paired with an Orvieto, which is both a growing region in pretty much the middle of Italy, and what they call the wine from that area. It’s a dryer, less sweet wine, and not as heavy or buttery as a lot of chardonnays these days. I enjoyed this dish, but thought it was a tad heavy on the almonds. The puree was smooth, buttery, and was the “glue” that tied in all the flavors. The sturgeon was perfectly prepared. The meat dish was a sirloin steak from Lucky Dog Ranch, also sous vide and then skillet seared with Oregon blue cheese, butter, a wild mushroom ragout, and whiskey demi and sous vide potatoes. I did have a small bite of this and was good, although Jeb found it to be a tad on the tough side. 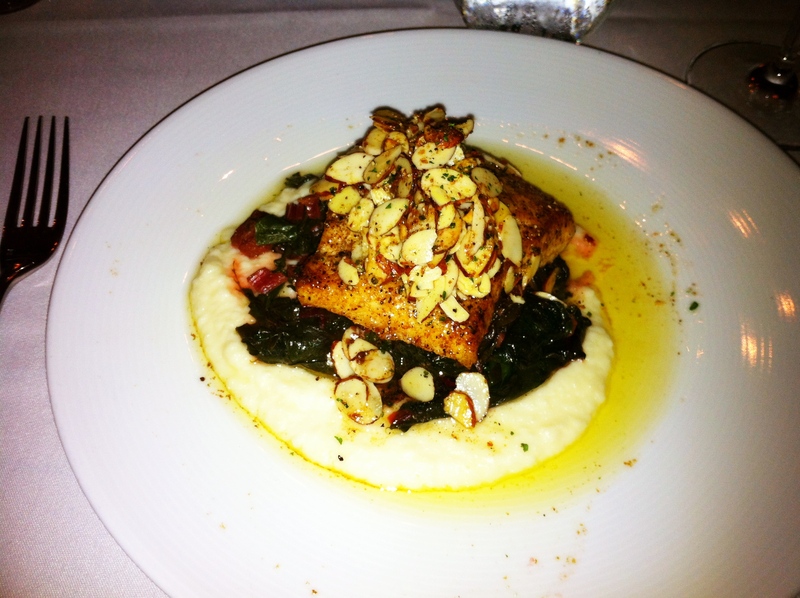 The flavors, however, were wonderful and it was cooked to exact specifications. This was paired with a Twisted Rivers syrah. 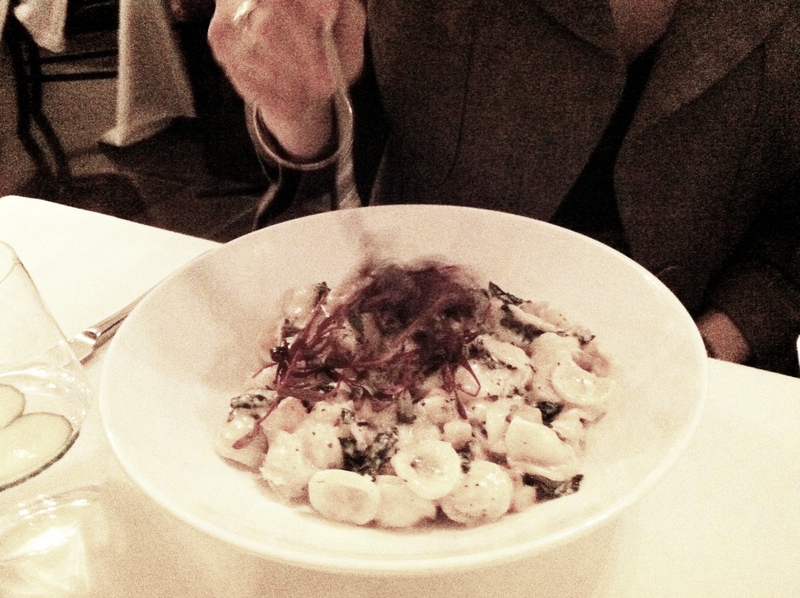 The full vegetarian of our group was given an orecchiette pasta with various veggies. This was perhaps the funniest order ever. When we asked what the vegetarian option was, the server had no idea, since apparently, they hadn’t had anyone request one. After he had found out for us, we were told it was “pasta with vegetables.” What kind of vegetables? “Whatever you see on the menu will probably be in there.” It turned out to be quite tasty, however, and a very large portion that was good enough for another meal. The reason for the caption? The menu said exactly that. 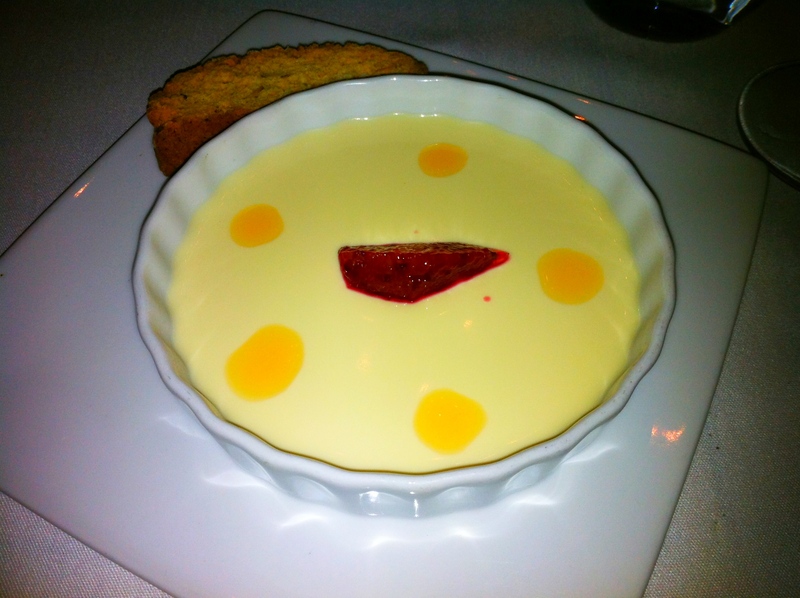 Dessert was a deliciously smooth, creamy, and utterly yummy panna cotta with a wedge of strawberry, orange glaze winter citrus, and almond biscotti, paired with a moscato d’asti that was light and refreshing. 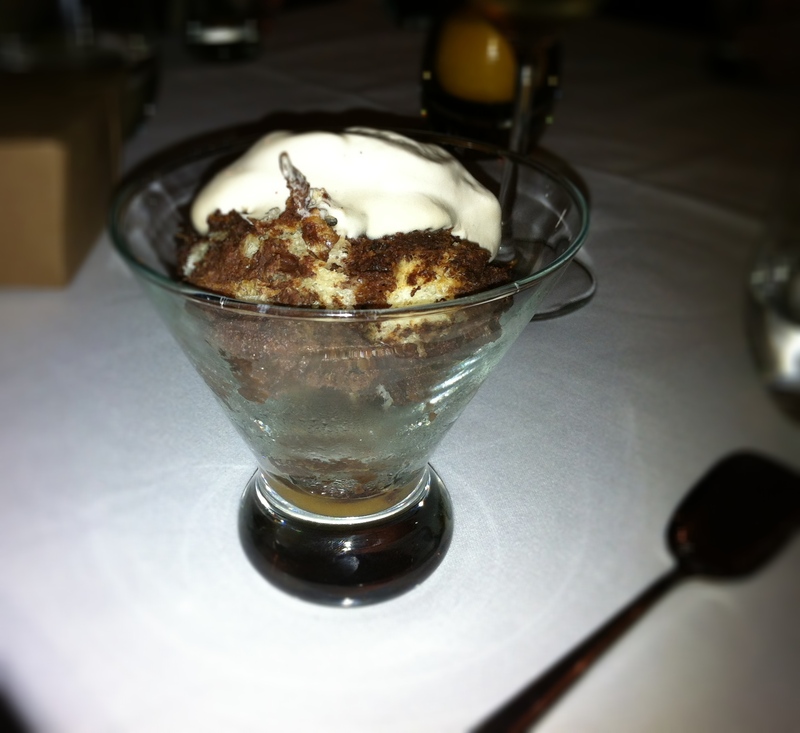 The other dessert was a chocolate bread pudding with whiskey sauce and salty caramel ice cream. It was quite a large serving that managed to not be too heavy. The ice cream was a lovely complement. While this was for the Dine Downtown week, however there are plenty of other delicious things to try if any of these dishes aren’t on the menu. The Mac and Cheese is one of my favorite (and I’ve had a lot of mac and cheese! 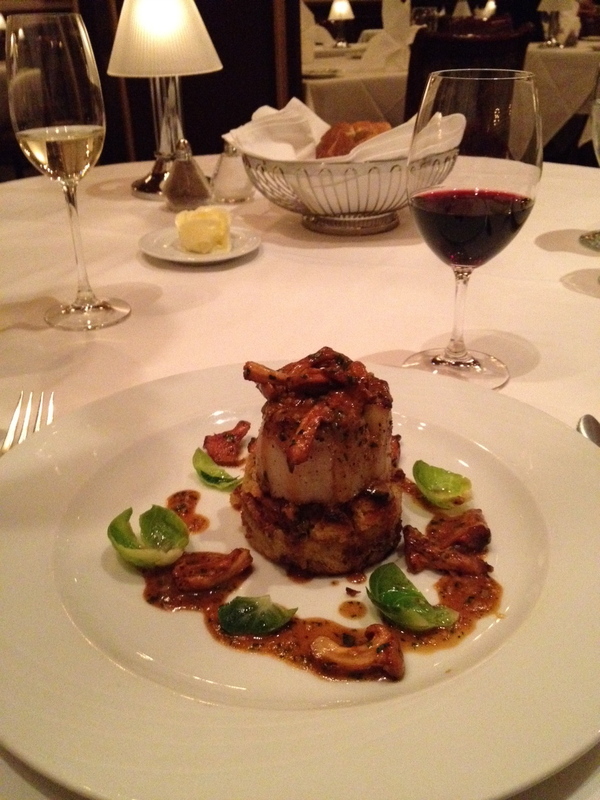 ), the scallops are just the perfect mix of sweet and savory, and the Passmore fish is always a good bet. And someone told me the burger was the best he’d ever had. On this occasion, the service at first, was incredibly slow and the server a little short and brusque. But I know he was incredibly busy, and it got much better as the evening progressed. So, to recap, request a downstairs seat when you make your reservation (they are on Open Table), order pretty much ANYTHING, and settle in for a fantastic night of food, cocktails, and friends. How did I kick off 2012? With a good ol’ southern style brunch from The Porch. 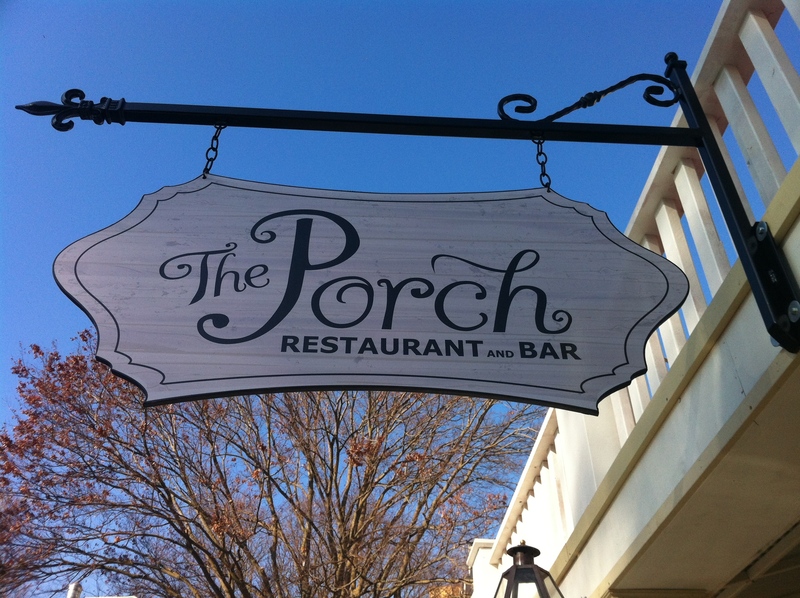 The first day of 2012 wasn’t just the first day of a new year, it was the first day of brunch for The Porch. Ambitious, right?! Going forward, they will be serving brunch on Sundays. First off, it was an absolutely gorgeous day. While we chose to sit indoors, when we left, the outside patio (porch) was fully occupied. 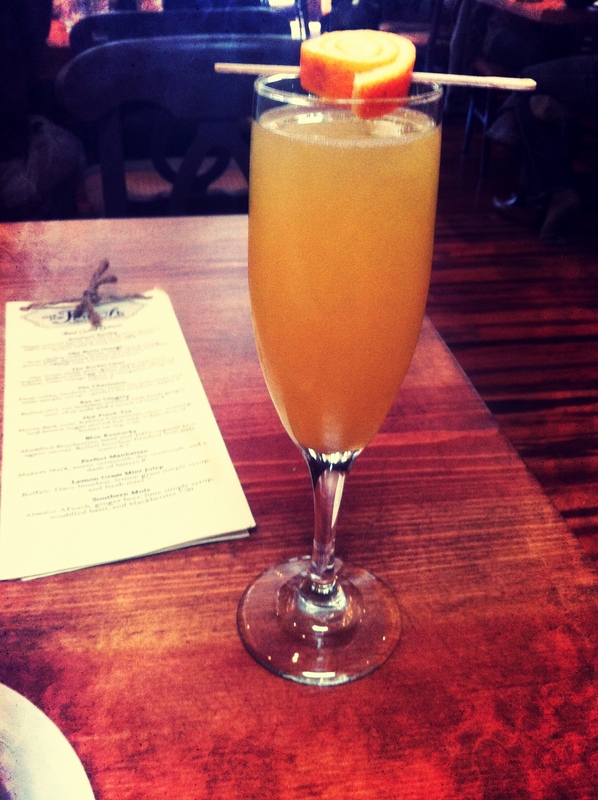 There’s no better way to start out the day, and a new year, with a wonderfully presented mimosa! It wasn’t bottomless, which was probably a good thing, but refills are just $3.50. Now came the fun part: the agonizing task of trying of decide what to order. There were several items on the menu that looked fabulous. Which to choose? The vegetarian omelet with mushroom, broccoli, cheese and hollandaise sauce? Or the jambalaya omelet….crawfish and Louisiana red rice and blue crab gravy. Or something simple like grits and eggs? 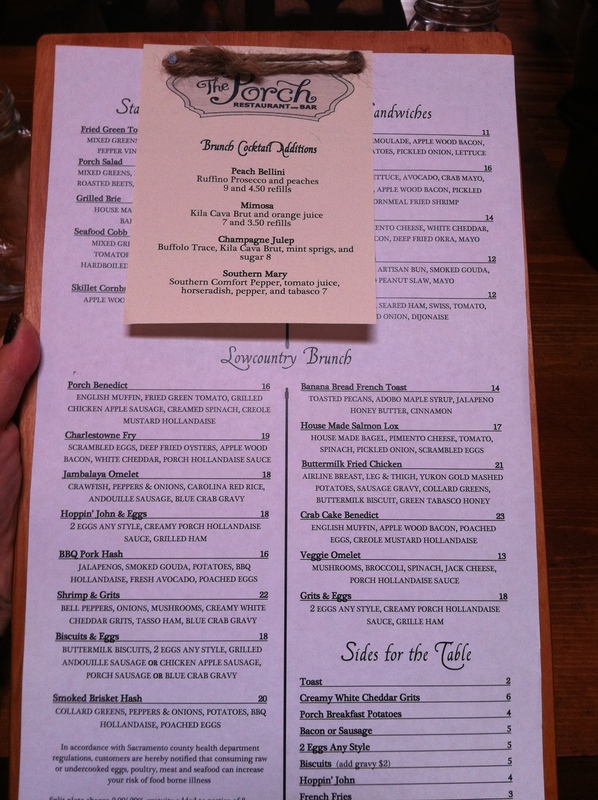 As you can see, the menu isn’t designed for vegetarians, aside from the veggie omelet. After all, this is Southern food, so you have to expect bacon, cheese, and eggs in pretty much everything! However, if you’re pescetarian, you will probably be okay with a few dishes. Plus, you can modify, if need be. However, I might be concerned with cross-contamination. Vegans, stay away! This is NOT the place for you! 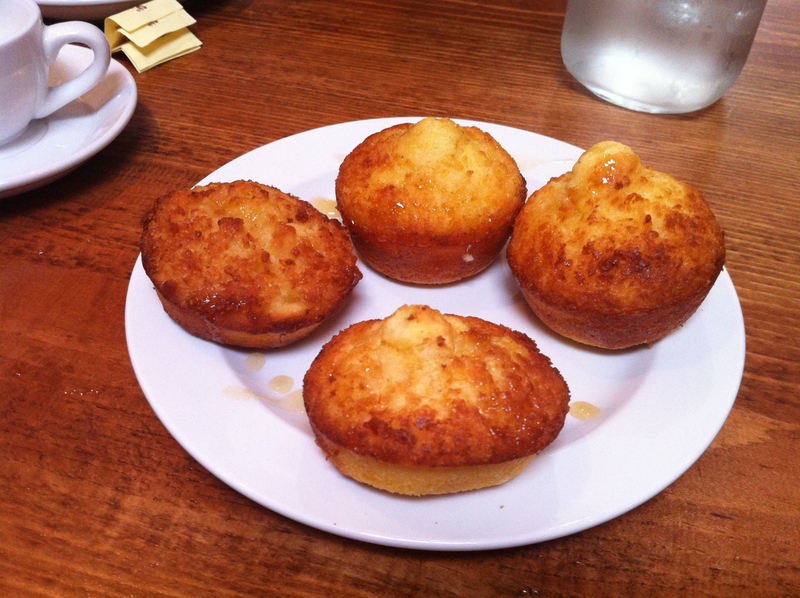 Before bringing out the meal, the chef sent an amuse bouche of bacon infused cornbread muffins with honey and a little bit of a kick. I believe this comes from their jalapeno butter! Super crabby crab cakes with a lemon and mustard hollandaise sauce, applewood smoked bacon, and potatoes that had a delicate vinegar flavor. This was absolutely delicious. The crab cakes were, well, super crabby! No skimping on the meat in these suckers! The hollandaise sauce was very unique, as were the potatoes. They were actually unlike any standard breakfast potato I’d ever had. 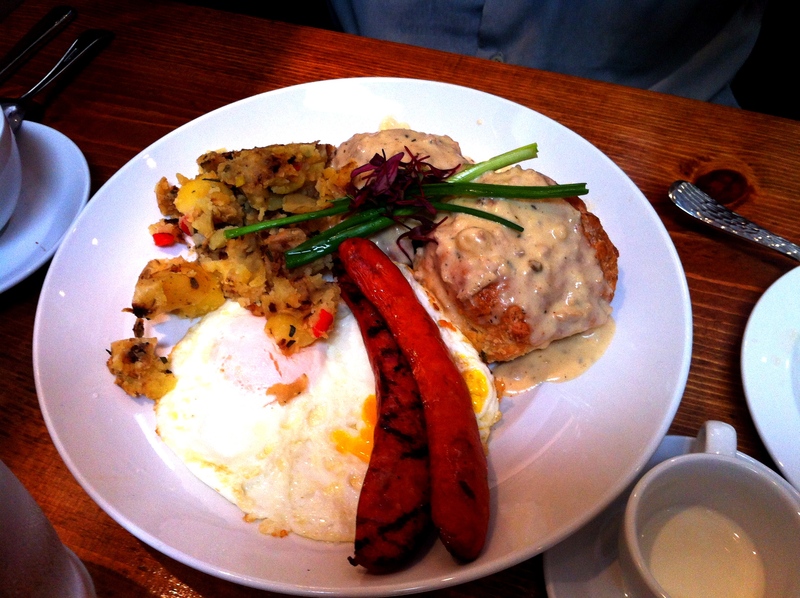 Eggs and biscuit, with The Porch gravy, andouille sausage and house potatoes. I like to do it my own way… Okay, so this is how I’m like a “Sally”: If they don’t have a dish I like, I make my own! Side of cheesy grits, with biscuits and blue crab gravy. The grits were really authentic. I could feel and see the corn kernels. They make them savory, and I don’t know if they have a sweet option. As for the biscuits and gravy? Holy shmoley these were good. Three huge biscuits and a crock of gravy that was so full of bad stuff, it almost turned healthy. I was eating these for three days! The gravy is almost reminiscent of some kind of amazing, ridiculously thick chowder, minus the potatoes. It’s delicately seasoned, so as not to overpower the crab flavor, with an amazing texture that worked awesome with the crunchy exterior of the biscuits. Because he is such a fan and wanted to share them, the server brought out ramekins of their apple blueberry jam and huckleberry jam for the biscuits. I really liked the huckleberry jam, but I said, screw the fruit, gimme the fat! Both jams are made in house. They try to do pretty much everything on the premises and are very adamant about sourcing their meats and produce from local purveyors. In fact, the server whipped out his cheat sheet to tell me the exact name and location of where they get their pork, chicken, beef, and anything else I might be wondering about. Some of the items on the brunch menu are also on their lunch/dinner menu, like the Porch Burger, Seafood Cobb Salad, and Shrimp and Grits. Just like with dinner, it’s likely you will get two meals out of this! 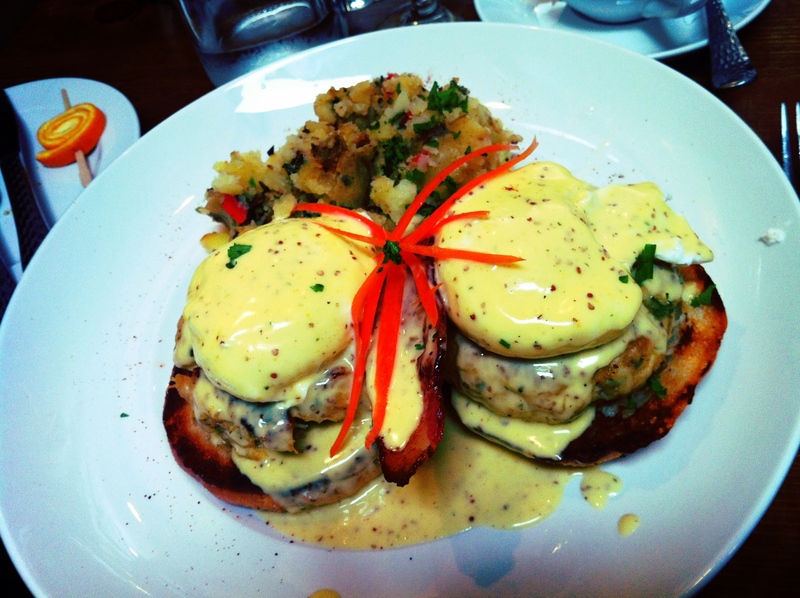 If you’re looking for a fun place for brunch, check it out. It’s not someplace I would regularly visit, just because it is a tad pricey and the food is a bit too rich for me (insert: fattening! ), but it’s super tasty and fun for special treat. Ah, Selland’s Family of Restaurants, you never fail me, nor cease to tantalize my tastebuds with tasty treats! “Don’t practice your alliteration on me!” (random Monty Python reference!) Ella, the “middle child” of the Selland’s family of restaurants (The Kitchen being the marriage proposal-anniversary celebrating kind of place and Selland’s Market Cafe being the “every day” haunt), it is definitely one of my favorite restaurants in Sacramento. When I decided to take off the Friday before New Year’s and give myself a four day weekend, Ella was on my mind as a spot I wanted to visit for a leisurely lunch, particularly after following Selland’s on Twitter and Facebook and hearing about all their delicious lunch specials! 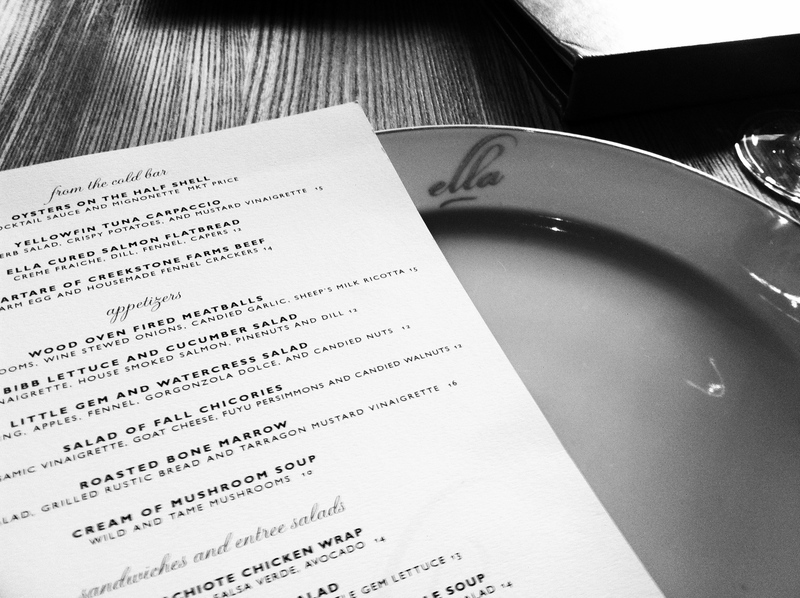 The first time I went to Ella was probably about six or seven years ago, fairly soon after they’d opened. My virgin visit came on the heels of my first trip to The Kitchen. After that amazing experience, I was dying to try out Ella. Since then, it has been on my list of top five places to take out of town guests. It’s located off of 12th and K, along the light rail route, though I’m not sure where the closest stop is. Valet parking is available for $5 right outside the front door on K. If you’re like me, and never have cash, Ella will conveniently add on the valet cost to your bill. If you’re more “independent,” there’s a parking garage on 12th between K and L, which they will validate. I don’t know what the building was before Ella took up residence, but it is beautifully decorated with comfortable chairs and an open floor plan. The kitchen is also within plain site, so you can watch them all you want. Unfortunately, I did not remember to take a photo of the wine cellar, but it’s glass enclosed and visible from the dining room so you can dream of what lies within… actually, you are welcome to explore it! The last time I was there, I wandered through the rows of cabernet sauvignon and meritages that made me drool and wish I had a sugar daddy (or mama!) to help me work my way through them! Upon walking into the restaurant, you are immediately greeted by a member of the staff. They are welcoming, warm, and there to take your jacket, or give you a stool upon which to place your purse, laptop, or briefcase. (I love this!) You know that you will be well taken care of and treated as if you are the only person there. But if you were wondering what you might see to the right of the oyster bar, this is it. 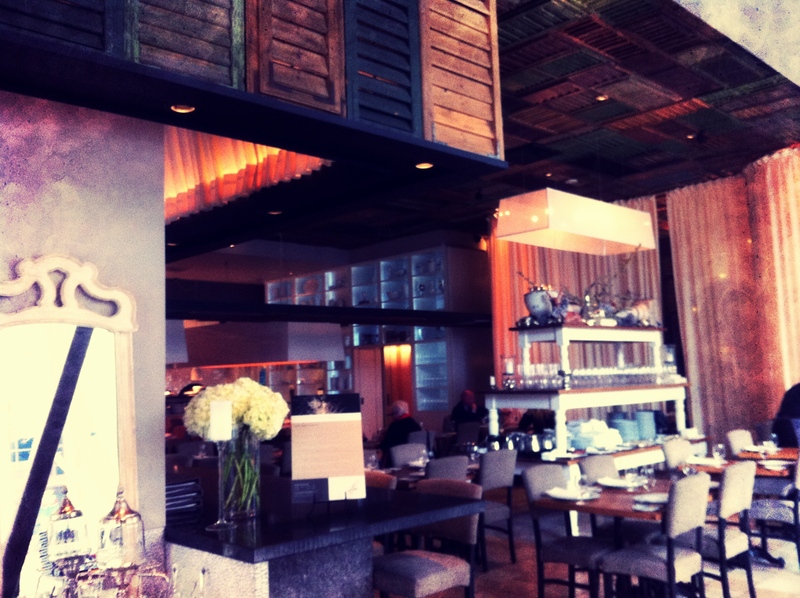 The dining room is open, and decorated with a modern, yet comfortable feel. The tables are a lovely, warm wood, the chairs cushy. Colorful, recycled shutters outline the bar area, and accent the spaces around the entire restaurant. 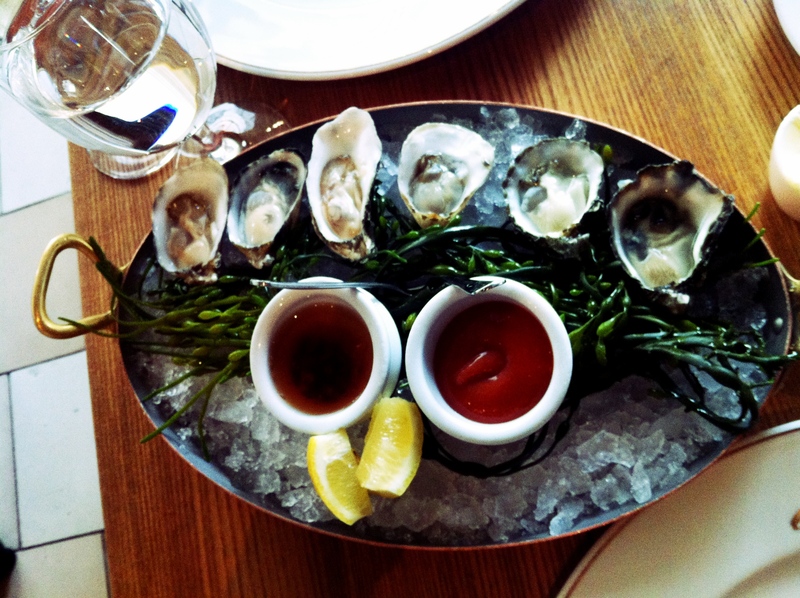 Half dozen oysters is never enough, but room for lunch must be left! 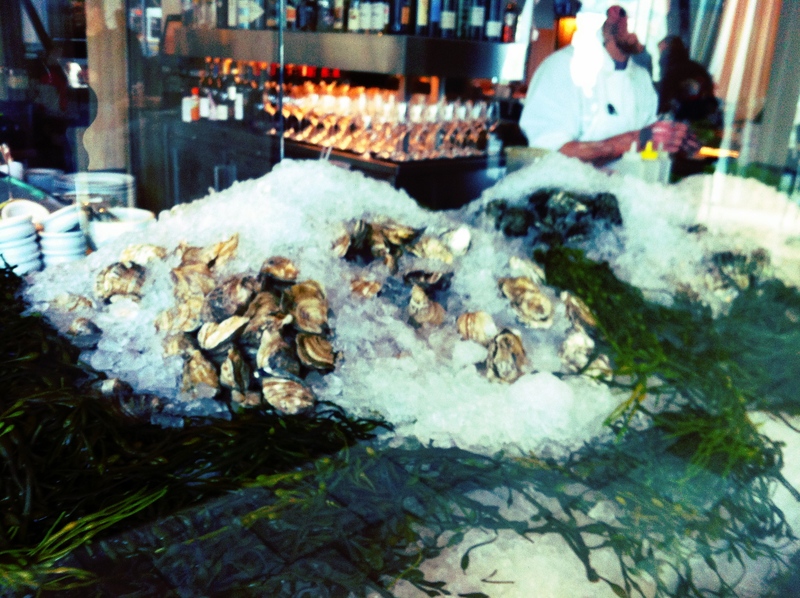 On today’s oyster menu: Kumomotos from Washington, Kusshis from British Columbia, and Shigokus, also from Washington. 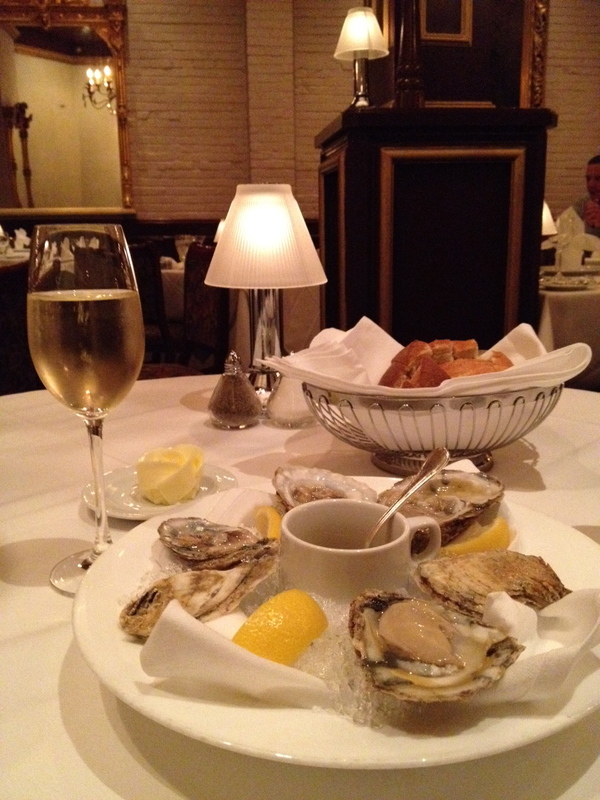 I learned that the “terroir” of oysters is much like wine… sandy versus rocky will produce different flavors. These are all delicate, light, flavorful, and simply fabulous. 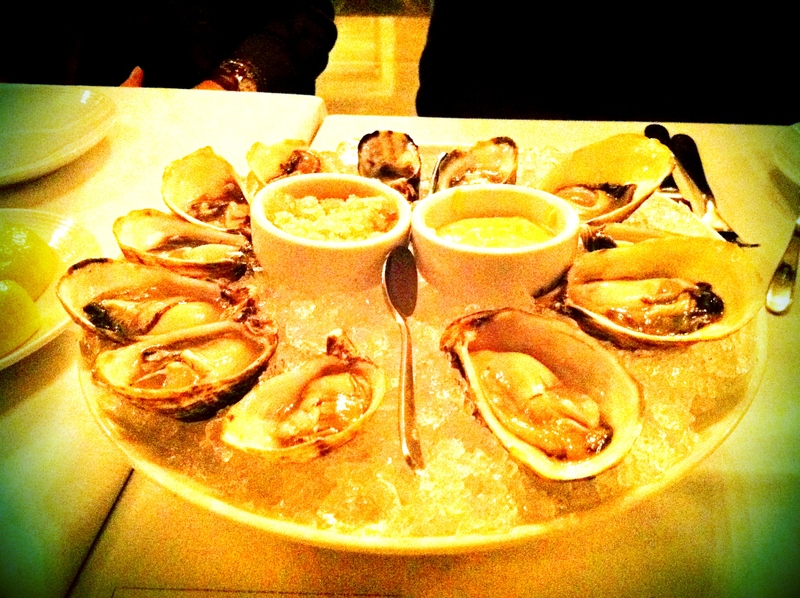 I could probably eat my weight in oysters! Of course, I’d have to declare bankruptcy shortly thereafter! They don’t restrict you to multiples of six, and you can mix and match all you want. 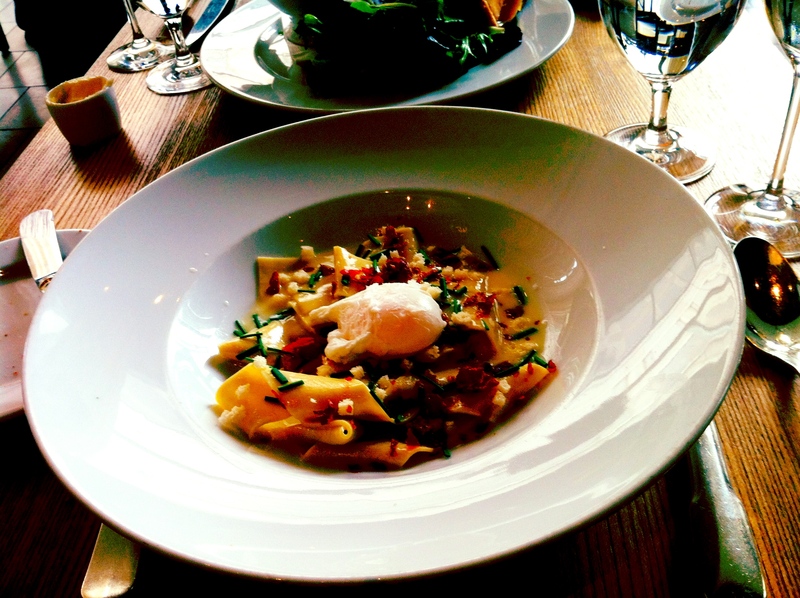 On the lunch menu was their papardelle. It’s something I’ve had before and absolutely love. It is quite popular, and rightly so! This is house made papardelle with a poached egg, crunchy, crispy bits of prosciutto (I totally forgot to tell them to leave if off, but somehow dealt with it ;-p ), and a preserved lemon sauce. Mixing the two together creates a hollandaise sauce, of sorts. The serving size is perfect and just exactly what my tummy wanted! 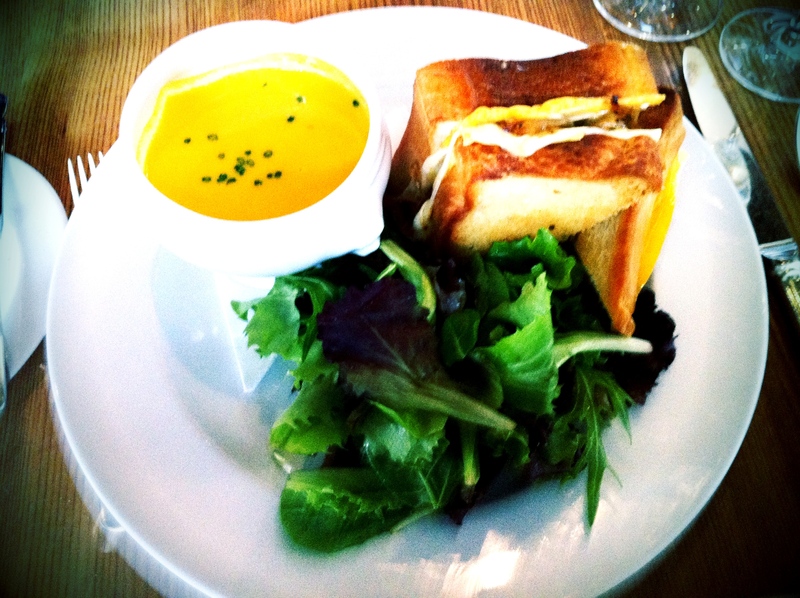 Briana had the grilled three cheese sandwich, made with cheddar, gruyere and parmesan on thickly cut brioche and included a mixed green salad and an amazing winter root vegetable soup garnished with chives. It tasted mostly of butternut squash, but was wonderfully complex, buttery, savory and nothing short of delicious! The centerpoint of the dining room is this amazing three tiered construction that houses the glasses, plates, cutlery, and various other items. There was no dessert this afternoon; my belly was much too full! If you’re thinking of heading to Ella for lunch someday, they do a weekly special that typically consists of a salad, an entree, and a soda or iced tea… all for just $15! Don’t feel like you’re getting short shrifted or that the only reason they’re running the special is to get rid of stuff! They’ve done dishes that include a cioppino style sauce with clams, mussels, salmon, walu and shrimp with papardelle. I was lucky enough to get some of that and it was delicious even after heating it up seven hours later! 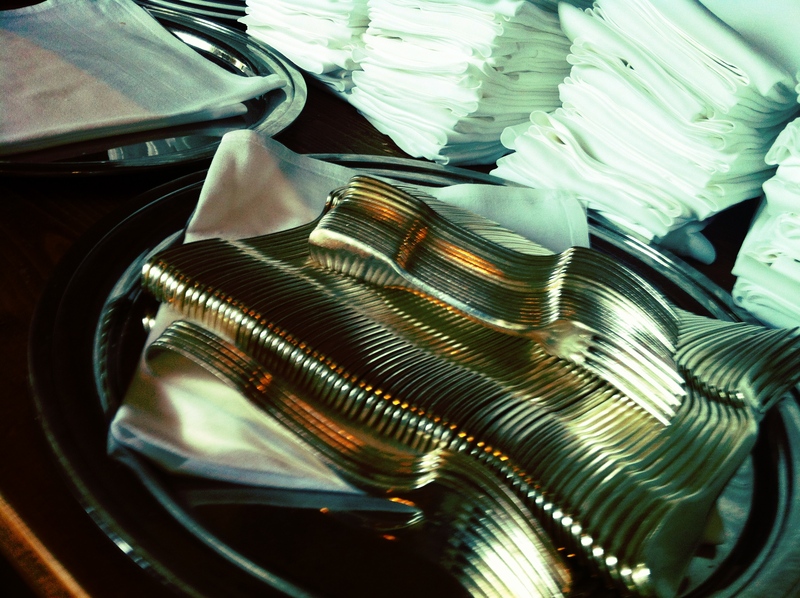 The service, the ambience, the food… everything comes together perfectly! What can I say? Ella is a great place to go on a date, to celebrate a special event, or to go just “because.” Think of it as champagne… great on a date, to celebrate a special event, or just for the heck of it! Make a generic Friday night into a special one! Bottom line: I give it 4.5/5 stars. I have been there a bunch and have never been disappointed! Price is mid-range, meaning you can order things on the lower side, or you can go crazy! Be sure to follow them on Twitter and Facebook.